Thank you for taking the time to visit our website. We look forward to discussing the opportunity to work with you. Click below to begin learning everything you need to know about our firm. What Makes Conexus Capital Management, LLC Different? We have often been asked what makes our firm unique and how we distinguish ourselves from traditional banks, trust companies, and investment management firms. We construct your portfolios according to your individual specific investment objectives, risk tolerances, return expectations, liquidity parameters, and tax constraints. We create personalized, unique portfolios in order to satisfy all of your needs. 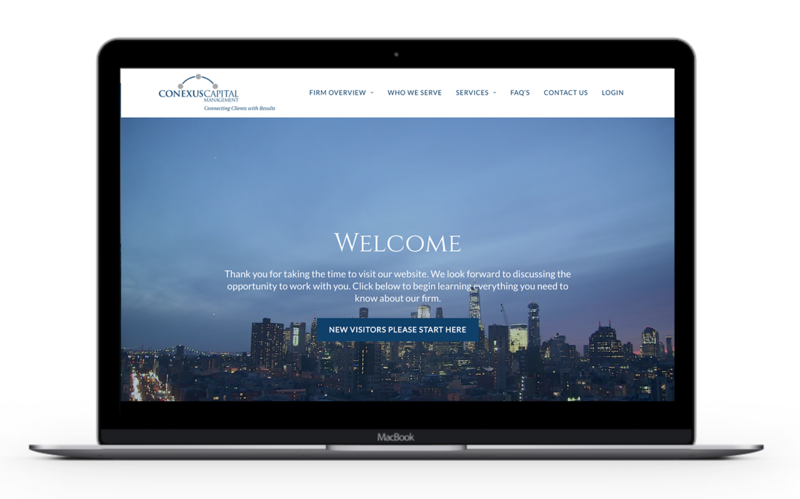 The founders of Conexus Capital Management, LLC have worked together for nearly thirty years. Our culture and company ownership structure fosters effective communication with our client base. We strive to provide full transparency in everything we do on behalf of our clients. This includes any and all costs or fees paid by our clients, as well as, why and with whom we allocate investments to. Our process, controls and execution infrastructure are that of a large firm, but we provide the personalized and responsive services of a smaller, singularly focused firm. We are a privately-owned, innovative registered investment advisor who partners with you to achieve your financial goals. We operate only in your best interest, in accordance with our fiduciary duty. We do not offer proprietary products to our clients. We utilize an objective advisory approach to access the top investment professionals across the globe in all asset classes and strategies. We have a structured investment team which combines thorough due diligence with broad-based economic oversight. When needed, we develop internal strategies for our clients. Our research and portfolio construction has generated superior results for our clients which is positioned for success over multiple investment cycles. At times, we deploy portfolio hedges to mitigate potential losses from perceived and unforeseen events. We provide successful families, individuals and entities with a full range of personalized and comprehensive wealth planning services utilizing our extensive investment and planning expertise. When appropriate, this planning is coordinated with your other professionals including your CPA, attorney and investment banker. One of our core principles is “to listen first.” We believe that communication is paramount in any relationship, especially one involving your wealth and financial goals. Markets are frequently dynamic and flexible investment choices may enable us to capture upside and potentially reduce downside risk. We provide an optimal client experience by embracing the latest technologies, allowing you access to your account at your convenience. Learned from our 50 years of collective experience, our 24-hour or less response policy will confirm that your affairs are being handled appropriately. When constructing portfolios we have the ability to use alternative strategies that complement traditional long only investing. As a client, you will have access to the latest wealth management technologies with convenient access to your account information at any time. Interested in learning more about becoming a client? Conexus Capital Management, LLC. Copyright 2017. Conexus Capital Management, LLC is a registered investment advisor located in Colorado. Conexus Capital Management, LLC and its representatives are in compliance with the current filing requirements imposed upon registered investment advisors by those jurisdictions in which Conexus Capital Management, LLC maintains clients. Conexus Capital Management, LLC may only transact business in those states in which it is registered, or qualifies for an exemption or exclusion from registration requirements. Conexus Capital Management’s, LLC web site is limited to the dissemination of general information pertaining to its advisory services, together with access to additional investment related information, publications, and links. Accordingly, the publication of Conexus Capital Management’s, LLC web site on the Internet should not be construed by any consumer and/or prospective client as Conexus Capital Management’s, LLC solicitation to effect, or attempt to effect transactions in securities, or the rendering of personalized investment advice for compensation, over the Internet. Any subsequent, direct communication by Conexus Capital Management, LLC with a prospective client shall be conducted by a representative that is either registered or qualifies for an exemption or exclusion from registration in the state where the prospective client resides. For information pertaining to the registration status of Conexus Capital Management, LLC please contact the SEC, FINRA or the state securities regulators for those states in which Conexus Capital Management, LLC maintains a filing. A copy of Conexus Capital Management’s LLC current written disclosure statement discussing Conexus Capital Management’s, LLC business operations, service, and fees is available from Conexus Capital Management, LLC upon written request. Conexus Capital Management, LLC does not make any representations or warranties as to the accuracy, timeliness, suitability, completeness, or relevance of any information prepared by any unaffiliated third party, whether linked to Conexus Capital Management’s, LLC web site or incorporated herein, and takes no responsibility therefor. All such information is provided solely for convenience purposes only and all users thereof should be guided accordingly. Conexus Capital Management, LLC is neither an attorney nor an accountant, and no portion of the web site content should be interpreted as legal, accounting or tax advice. PLEASE NOTE: The information being provided is strictly as a courtesy. When you link to any of these web-sites provided here, you are leaving this site. Conexus Capital Management, LLC makes no representation as to the completeness or accuracy of information provided at these sites. Nor is Conexus Capital Management, LLC liable for any direct or indirect technical or system issues or any consequences arising out of your access to or your use of third-party technologies, sites, information and programs made available through this site. When you access one of these sites, you are leaving Conexus Capital Management’s, LLC web-site and assume total responsibility and risk for your use of the sites you are linking to.